Tomorrow is King Carl XVI Gustaf of Sweden's 70th birthday, and the festivities kicked off this evening with a concert at the Nordic Museum. 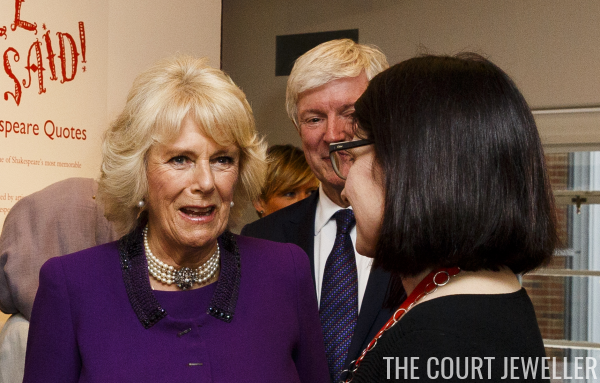 With one birthday celebration wrapping up and another starting, this week included a number of glittering royal appearances. Be sure to vote for your favorites in the poll below! 10. 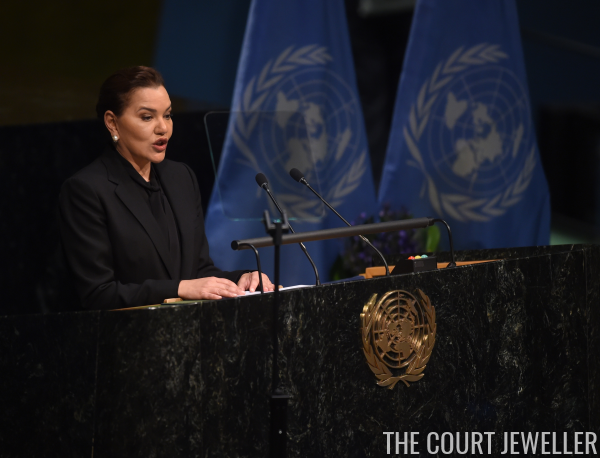 Princess Lalla Hasna of Morocco, the king's sister, spoke at the United Nations in New York on Friday during the ceremony for the signing of the Paris Agreement. 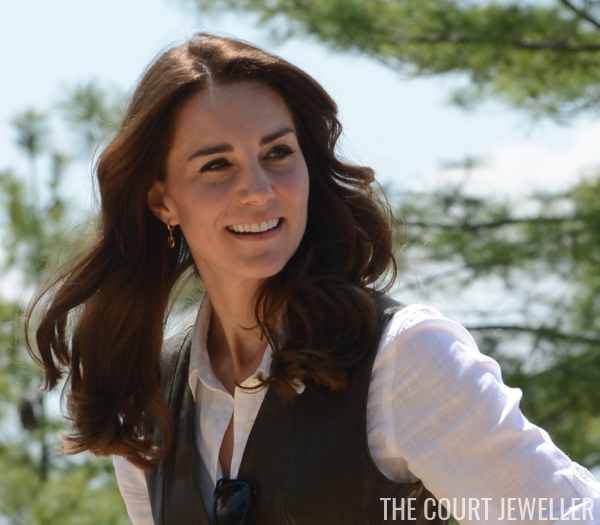 She selected a chic, understated pair of pearl earrings for the occasion. The Duchess of Cornwall began a set of engagements on Thursday with a visit to the Queen Mother Hospital for Small Animals. 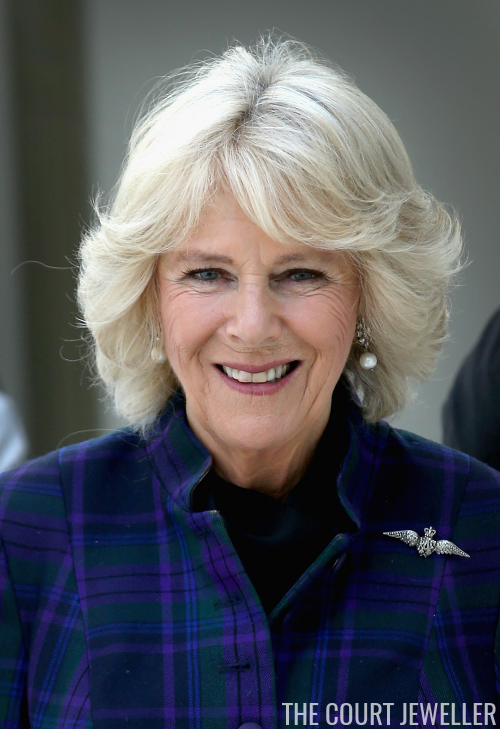 Camilla was there in her role as patron of the Royal Veterinary College Animal Care Trust. 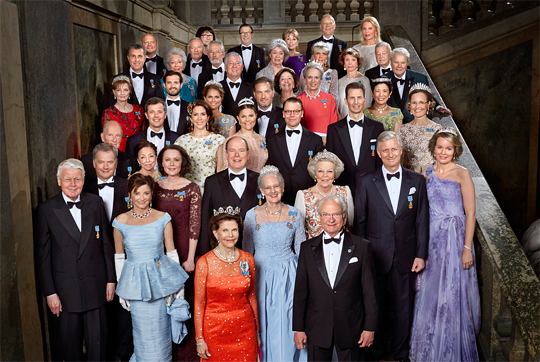 The final event of King Carl XVI Gustaf of Sweden's 60th birthday celebrations was the most glittering: a gala dinner at the palace. 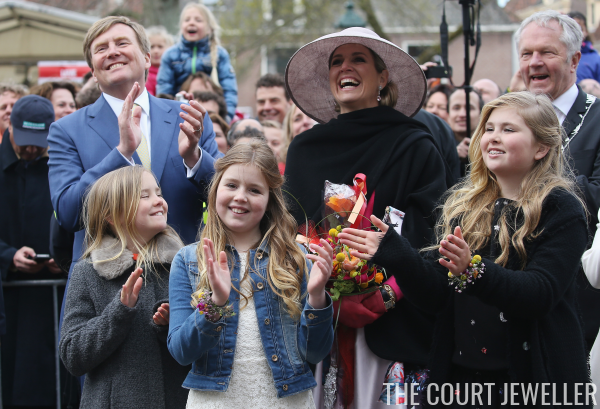 Today, King Willem-Alexander of the Netherlands celebrates his 49th birthday, and the Dutch royals gathered for the annual King's Day festivities. 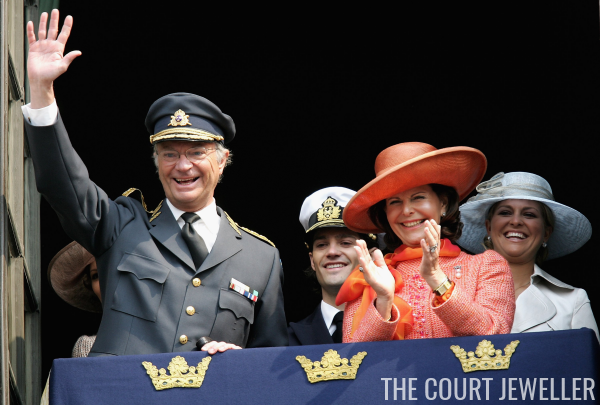 The celebrations were held in Zwolle this year, and there were lots of jewel-wearing royal ladies in attendance. 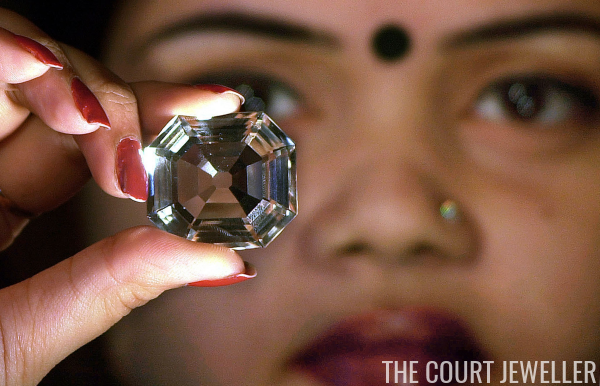 Over the past few weeks, we've seen a few developments in one of the claims on the Koh-i-Noor diamond, the famous stone that originated in India and is now a part of Britain's crown jewel collection. Sonam Rabgye, the jeweler who made the endless knot necklace given by the Queen of Bhutan to the Duchess of Cambridge, has sent us an excellent close-up of the necklace's intricate pendant. 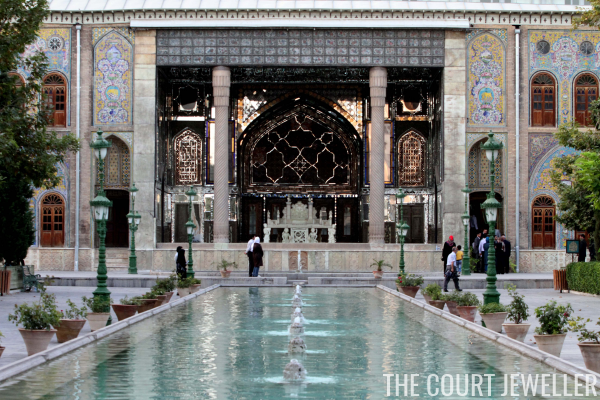 From The New Illustrated Magazine -- Who has not heard of the Persian jewels: their glory, their number, their priceless worth? When the doors were unlocked and I was taken into the Peacock Throne Room , I found myself surrounded by a mass of wealth unequaled in the world. Nowhere are such treasures. But nowhere, also, is there such an accumulation of rubbish. I will, however, dismiss the rubbish, and refer only to the treasures. Down each side of the room were chairs entirely covered with sheeted gold, and at intervals were tables of gold, nailed, I shuddered to note, with the commonest of black-headed tacks! 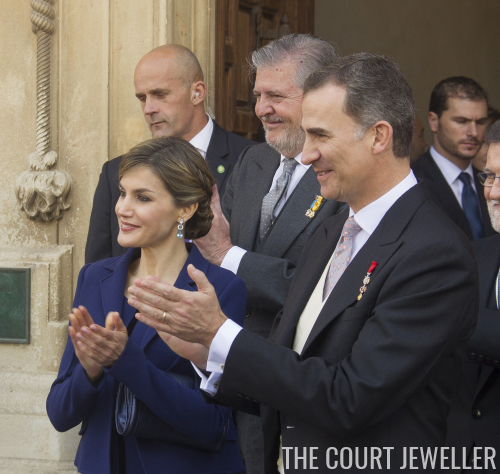 On Friday, Queen Letizia of Spain wore a stunning pair of gold earrings for two events at Zarzuela Palace in Madrid. While the Spanish royals were honoring the legacy of Miguel de Cervantes, the Windsors were marking the 400th anniversary of the death of William Shakespeare, who died on the same day as Cervantes in 1616. At the Sun Military Awards in December 2011, the Duchess of Cambridge stepped out in a new suite of diamond and ruby jewels. The set includes a necklace and a coordinating bracelet. Today is the 400th anniversary of the deaths of two literary giants: William Shakespeare and Miguel de Cervantes. The Brits are feting Shakespeare in Stratford, as we'll see later, and Madrid, the royal are celebrating the legacy of Cervantes. 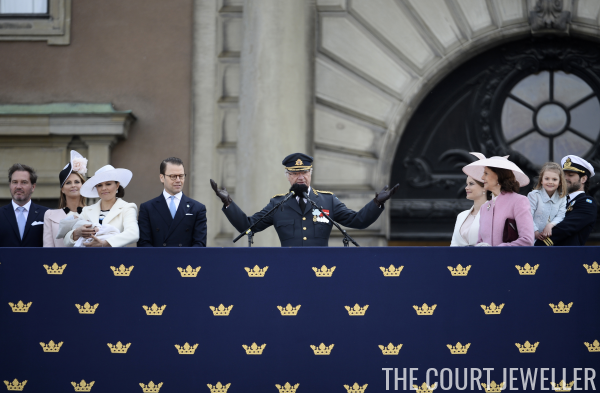 On Friday, a te deum service was held in Stockholm to give thanks for the birth of the newest member of the Swedish royal family, Prince Alexander. 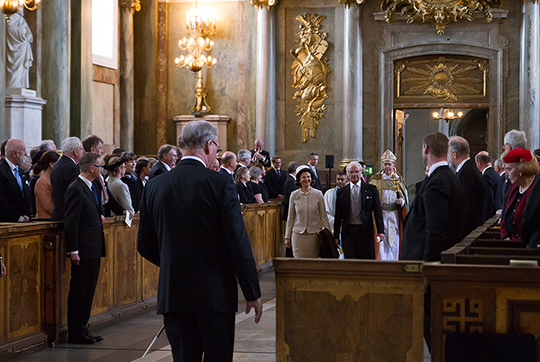 You can read the full program of the service here. President and Mrs. Obama capped off a day in Britain with a dinner at Kensington Palace. 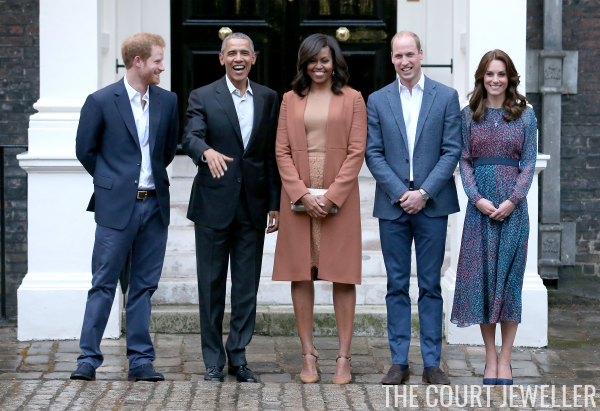 William, Kate, and Harry were all on hand to host. 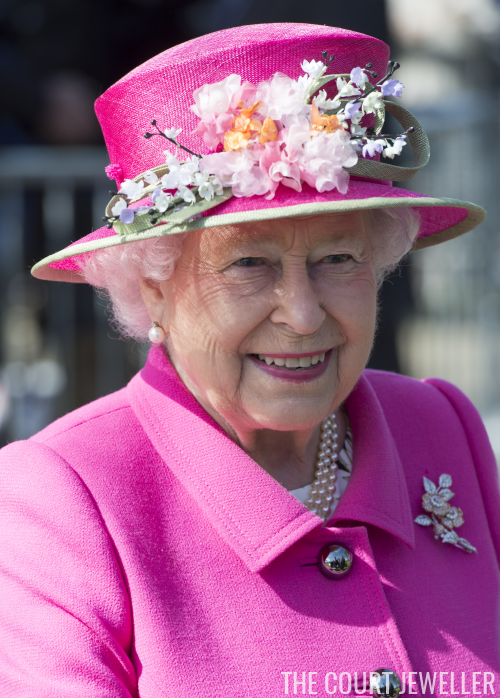 Patricia Treble, royal writer at Maclean's, published an article yesterday that will be right up your alley: a birthday tribute to the brooch, the Queen's favorite accessory. 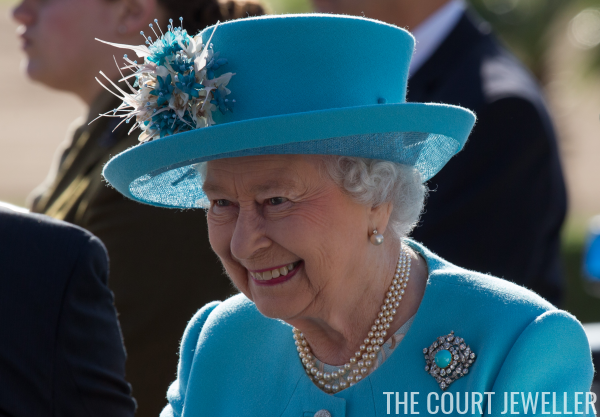 The article discusses numerous pieces from the Queen's collection, including the Jardine Star Brooch worn yesterday in Windsor, the brooch from the crown ruby suite, and the Albert brooch. And, as icing on the cake, The Court Jeweller gets a few mentions here and there as well. Enjoy! Last night's utterly charming new BBC documentary Elizabeth at 90 has made an appearance on YouTube, for those of you who weren't already able to view it. Note: if you're going to watch it, I'd do so quickly -- videos like these are inevitably removed soon after they're uploaded. Also of note: the BBC will be airing an extended 90-minute version of the same documentary on Sunday afternoon. Enjoy! 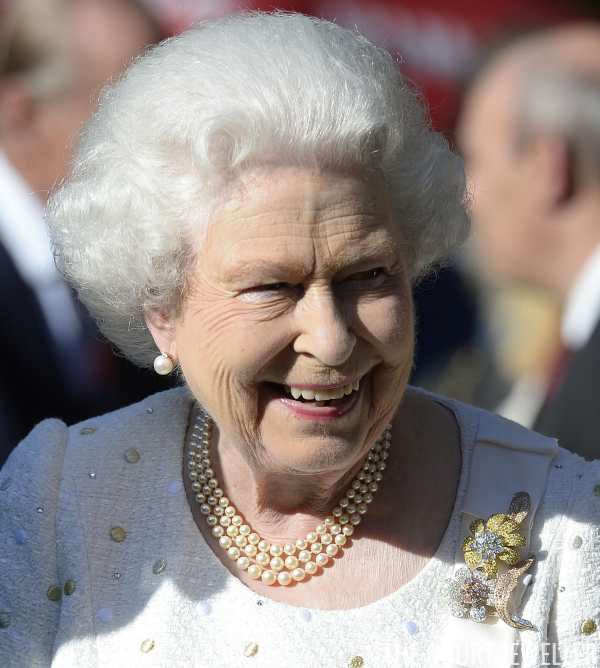 Following Thursday's big 90th birthday celebrations, it was back to business as usual on Friday for Queen Elizabeth II. 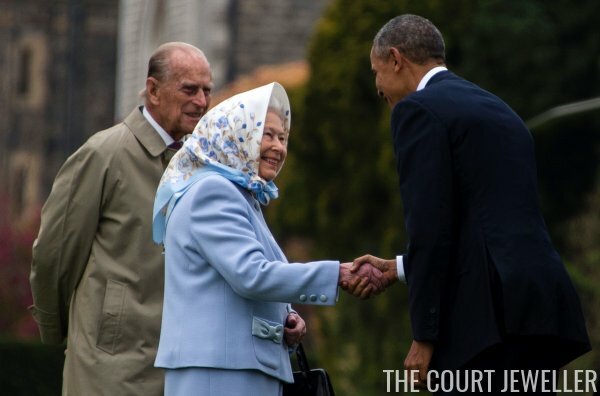 She and the Duke of Edinburgh hosted President and Mrs. Obama of the United States for a lunch at Windsor Castle. A major royal birthday was the biggest event of the week, but everyday engagements brought us quite a bit of sparkle, too. Be sure to vote for your favorites in the poll below! 10. 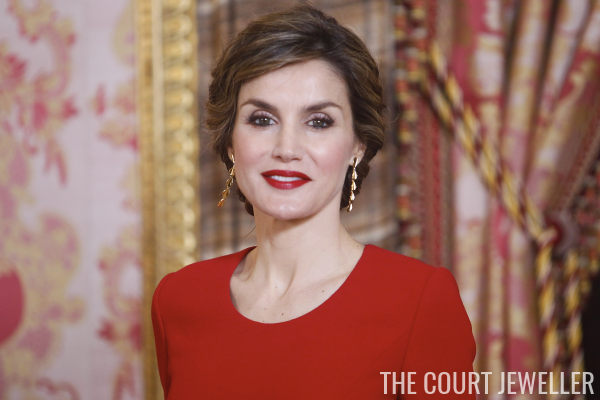 On Saturday, the Countess of Wessex wore simple earrings, a pendant necklace, and a Girlguiding pin to open the organization's new headquarters in London. 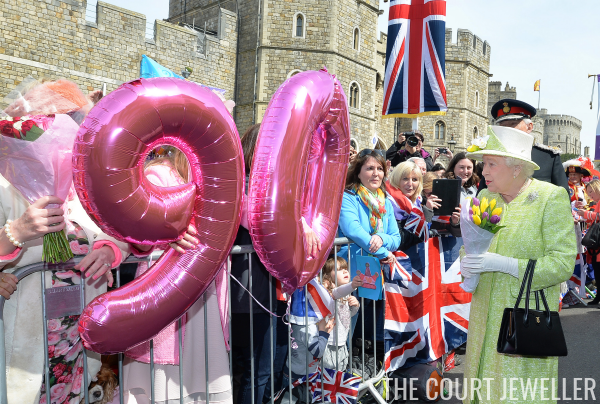 Queen Elizabeth II of the United Kingdom was in Windsor today, where she celebrated her milestone 90th birthday with a walkabout. Yesterday, Sky News ran a special report on the Queen's 90th birthday. The special includes footage from throughout her reign, plus interviews with the Duke of Cambridge and the Earl and Countess of Wessex. Enjoy! Today, Queen Elizabeth II of the United Kingdom celebrates a big milestone: her 90th birthday. 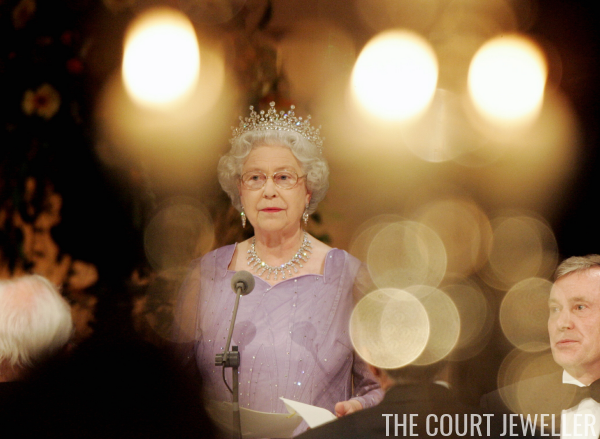 We've already done a bit of royal jewel pre-partying here with our 90 Years, 90 Jewels series, but I thought we'd cap things off today with a bit of tiara fun. 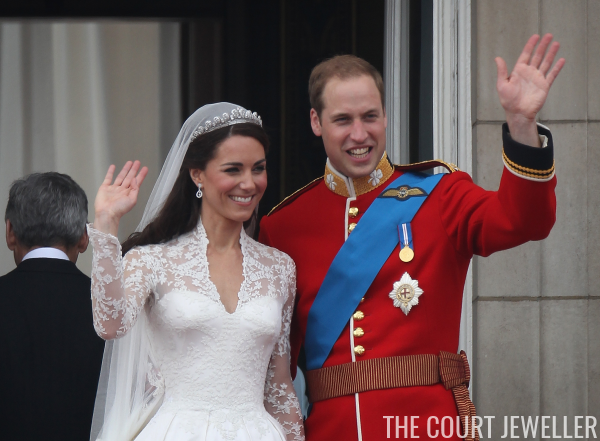 Here's a rundown of all of the tiaras that the Queen has worn in public. (There are also many that she owns but has not worn -- see the 90 Jewels series for many of those!) 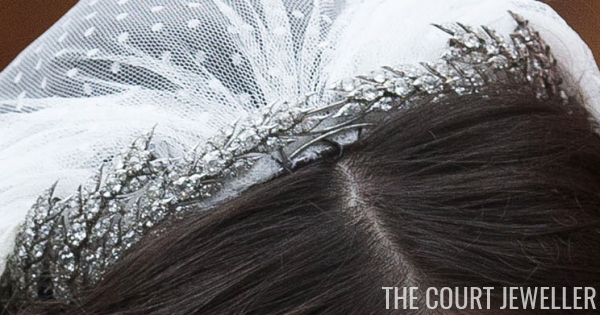 At the end, be sure to vote in our poll for your favorite tiara! The day before her 90th birthday, Queen Elizabeth II of the United Kingdom was out and about in Windsor, where she officially opened the new Alexandra Bandstand and marked the 500th anniversary of the Royal Mail delivery service. 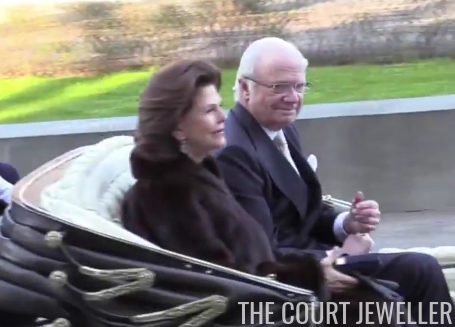 90 Years, 90 Jewels: Bonus Jewels! 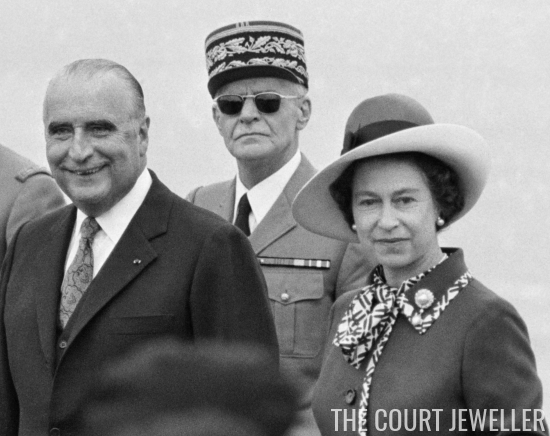 For the past nine days, we've looked at ninety pieces of jewelry worn by the Queen, but of course, there are lots of pieces that we didn't discuss. 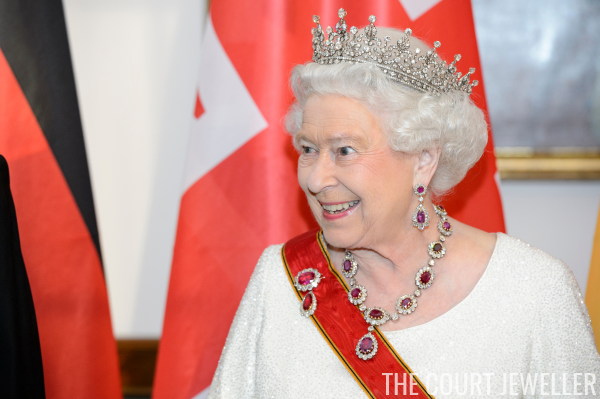 Here's a look at some of them -- specifically, ten more pieces of jewelry from the Queen Mother's bequest that the Queen hasn't worn herself. Near the end of last week's royal tour of India and Bhutan, Queen Jetsun Pema of Bhutan gave the Duchess of Cambridge a gold necklace with an intricate pendant. People writes this week that the necklace was designed by Bhutanese jeweler Sonam Rabgye. Shall we start our name guesses? 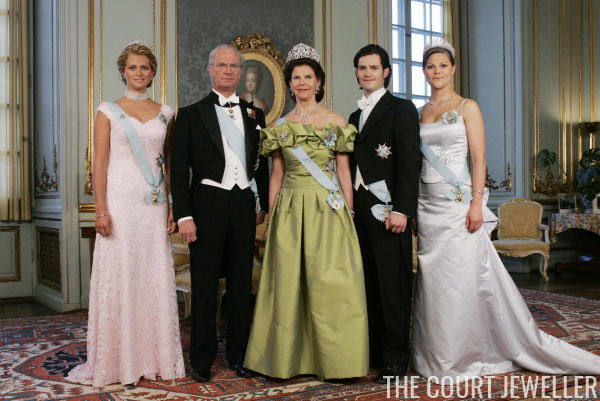 If I had to put money on it, I'd expect to see Bertil among the names, in honor of Carl Philip's beloved great-uncle and godfather, Prince Bertil of Sweden. 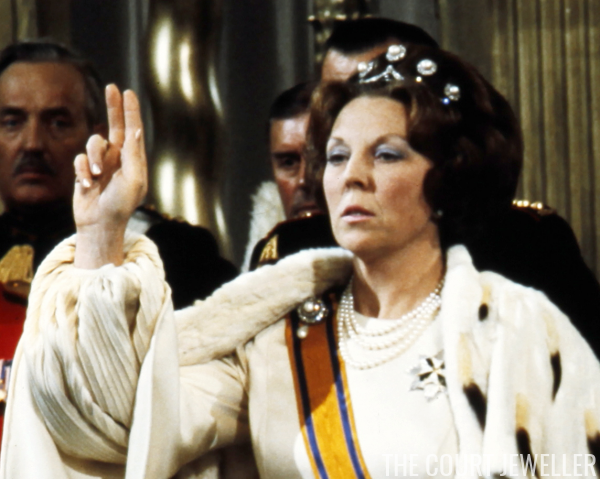 The Queen's jewelry collection got another huge boost in 2002 after a sad event -- the death of the Queen Mother at the age of 101. 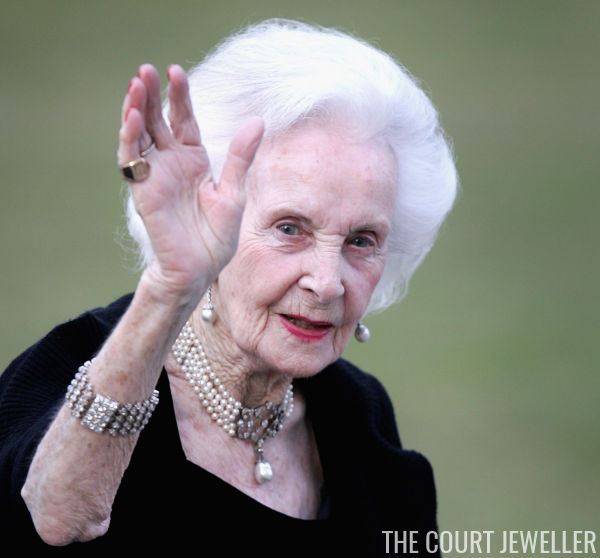 The Queen Mum was a total jewel lover, and her jewelry box was extensive, packed with gems from the Greville bequest and her own years of collecting and receiving gifts -- plus a few heirlooms of the crown that she kept even after her daughter became monarch. 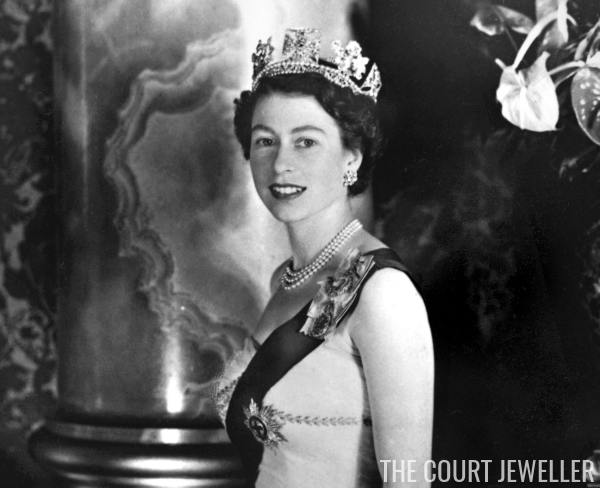 Here's a look at ten of the pieces that the Queen has worn from her mother's jewelry bequest. 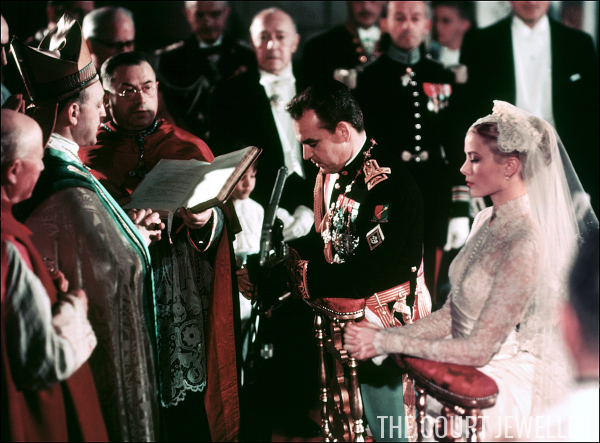 Today is the 60th anniversary of the civil wedding celebrations of Prince Rainier III of Monaco and his American bride, Grace Kelly. 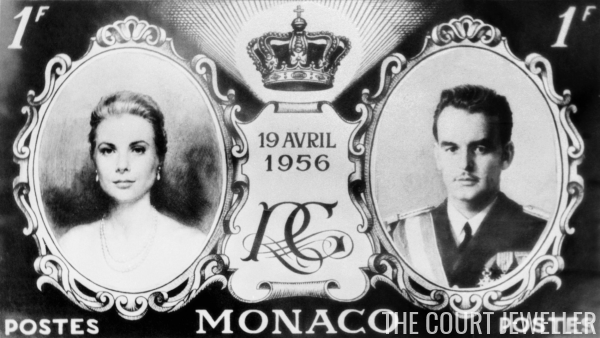 After the pair's civil wedding service at the Palais Princier, a gala was held at the principality's opera house. 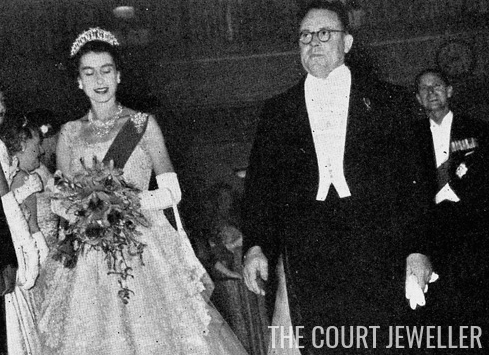 Grace wore gala jewels, including a tiara, for the first time that evening. 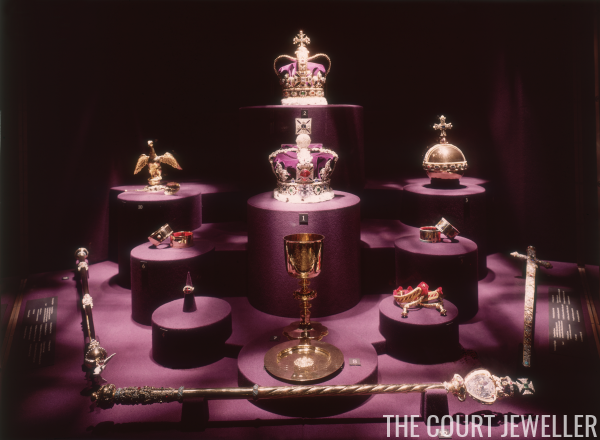 With the jewels from her wedding gifts, the heirlooms of the crown, and Queen Mary's bequest already crowding her jewelry box, the Queen made fewer acquisitions during the next era of her reign. Even so, new pieces joined the collection at various stops along the way. Here's a look at ten pieces acquired between 1973 and 2002. The Duke and Duchess of Cambridge's tour of India and Bhutan wrapped up yesterday after an eventful week of events across two nations. 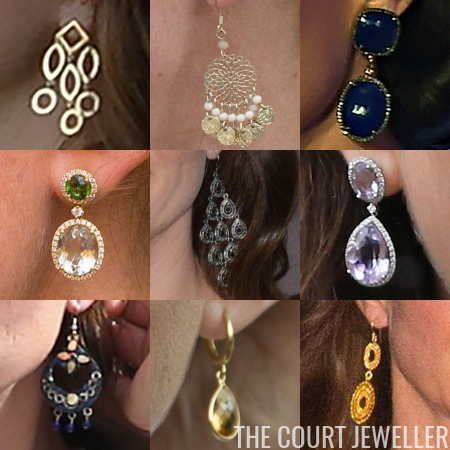 If you missed any of our posts on the jewels worn by Kate during the tour, here's a handy recap of our posts. 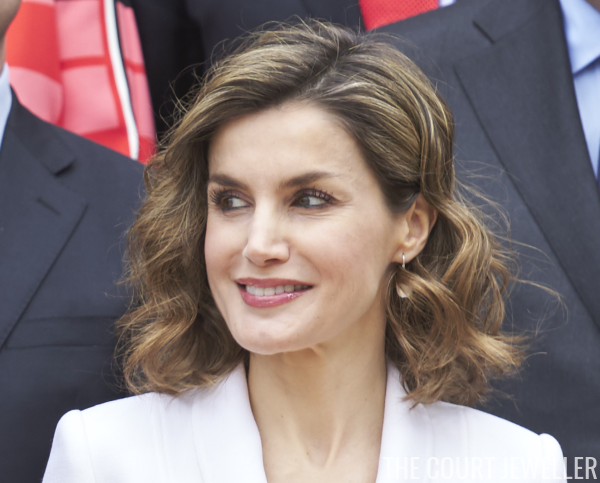 She didn't make our super-packed royal jewel roundup this week, but Queen Letizia of Spain was out and about in a couple of pairs of earrings. 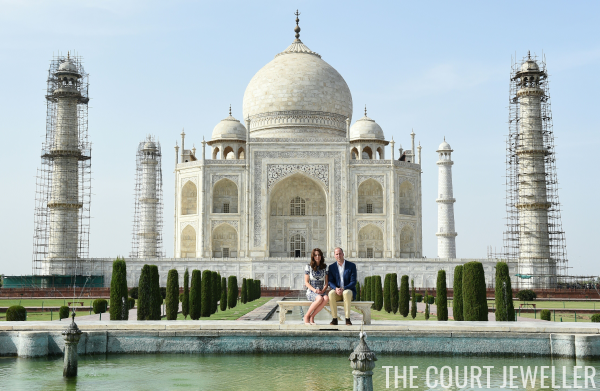 The final event of the Cambridges' tour of India and Bhutan was probably the most highly anticipated of all: their visit to the Taj Mahal in Agra. The grand monument is actually a mausoleum; it was built in 1653 by the Mughal emperor Shah Jahan for his beloved wife, Mumtaz Mahal. William and Kate said a rainy farewell to Bhutan on Saturday morning before taking off for Agra and the Taj Mahal. 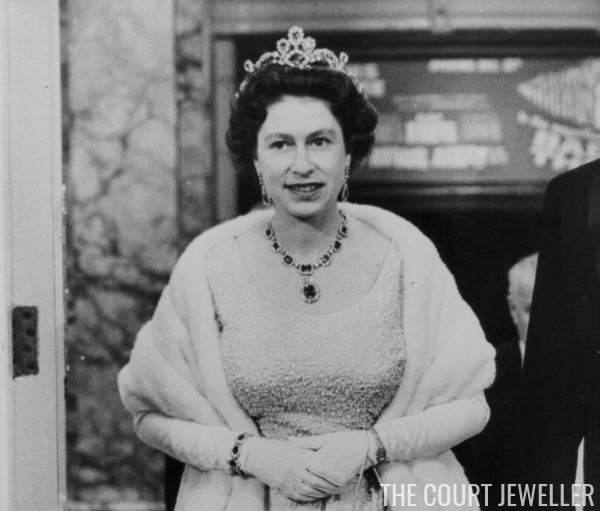 Queen Mary's jewel bequest to her granddaughter, Queen Elizabeth II, was so extensive that one post wouldn't even begin to represent its breadth. 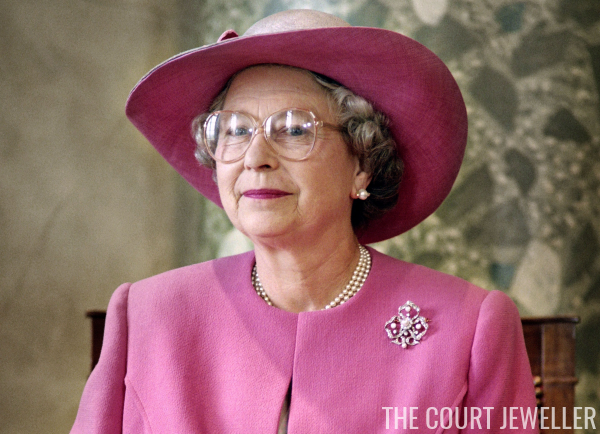 Today, we're looking at ten of the brooches that the Queen inherited from her grandmother in 1953, forming a strong cornerstone to a brooch collection that is still growing today. For an evening reception in Thimphu, Kate paired a red poppy-printed gown by Beulah with familiar earrings -- it's another outing for the Cassandra Goad Temple of Heaven girandoles. For another of the outdoor events on the tour -- a six-hour long hike to Tiger's Nest, a monastery high in the mountains of Bhutan -- Kate went appropriately casual. 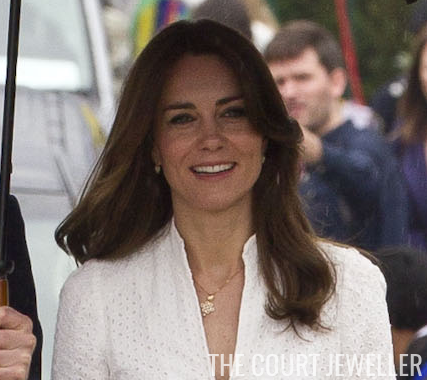 In a week with a major royal tour and a state visit, you know we've got some sparkle to discuss! This is my list of the top ten pieces of the week -- be sure to vote for your favorite in the poll below! 10. 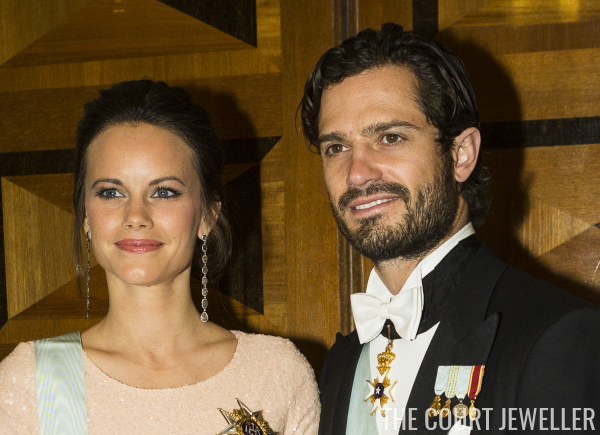 Queen Mathilde of the Belgians wore a pair of gold statement earrings on Thursday at a prize ceremony in Brussels. Only a few months before Queen Elizabeth II's coronation, her beloved grandmother, Queen Mary, died of lung cancer. 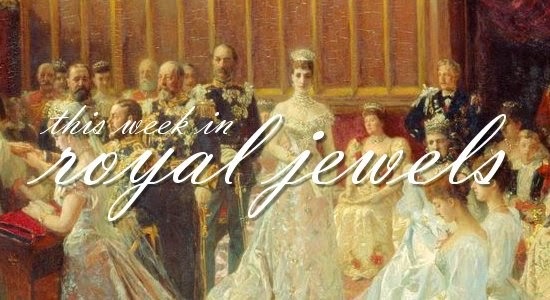 Elizabeth had inherited the "heirlooms of the crown" only eleven months earlier; now, Queen Mary bequeathed her a huge cache of jewels, many of which have formed the cornerstone for her royal jewelry wardrobe throughout her reign. 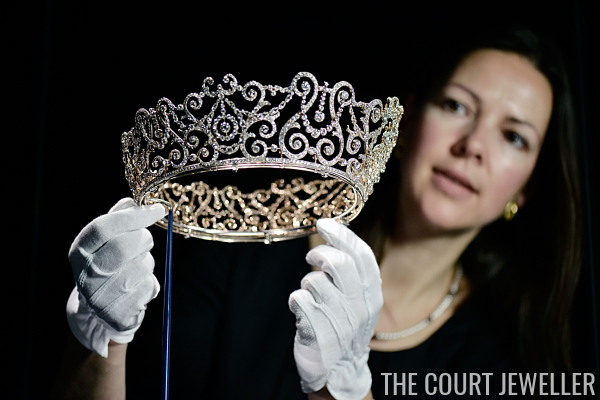 Here's a look at ten pieces from the Queen Mary bequest -- and stay tuned tomorrow for even more. 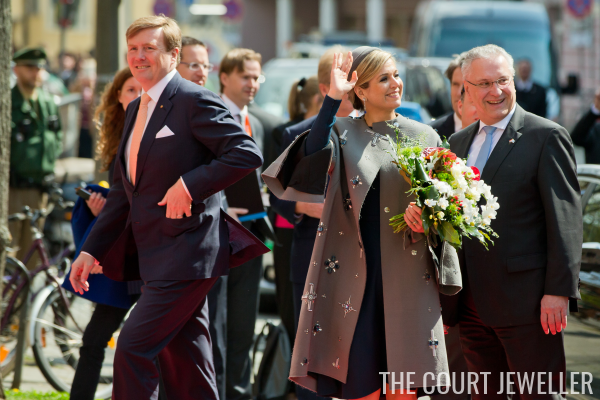 King Willem-Alexander and Queen Maxima of the Netherlands continued their visit to Bavaria and Wednesday and Thursday, and there were jewels galore.